Fennel is a common herb used in our kitchens and also an old-fashioned cough remedy that will loosen phlegm and ease coughs and colds. For 2000 years many people have relied on the herbal extract, or tea, for its digestive and weight control benefits. Promotes the functioning of the liver, kidneys, spleen and clears the lungs. It is mainly used for digestive disorders. It has an abundance of flavonoids which exert mild estrogenic effects. It has been useful for colic, menstrual cramps, gas, excessive mucus, indigestion, abdominal distension and an excellent herb for Irritable Bowel Syndrome (IBS). This herbal tincture has been used successfully to prevent griping when strong laxatives are indicated. The seed's medicinal properties have been shown to help in the treatment of kidney stones. As a diuretic, Fennel promotes urine flow. It is also thought to increase perspiration and reduce intermittent fevers. In addition, Fennel is believed to promote the functioning of the kidneys, liver, and spleen, and may reduce toxic effects of alcohol on the body. Fennel has also been used after chemotherapy and/or radiation treatments for cancer. Fennel Seed extract is widely known for its benefits for digestive problems, including indigestion, flatulence, constipation and diarrhea. Some of its components, such as essential oils, acts as stimulants for the digestive tract and can increase the secretion of digestive and gastric juices. The actions are helpful to facilitate proper absorption of nutrients by your small intestine. Fennel also contains amino acid histidine, which may aid in the proper functioning of the entire digestive system. Because it relaxes the smooth muscle lining of the digestive tract, it has helped alleviate acid-stomach, the symptoms of food poisoning, motion sickness, bloating, nausea and vomiting. Fennel is an aromatic stimulant and a great herb for the gastric pain and colon disorders and also found to be helpful to ease infant colic. Although it is sometimes thought to perk up a poor appetite, the herb may also help in weight loss programs. Fennel seed has been used successfully as both a metabolic enhancer and as a natural appetite suppressant. It is also considered to be a natural diuretic that can relieve bloating and aid in the reduction of water retention. Fennel seed extracts have an added benefit with regard to fat reduction in that it helps break up fat deposits in the bloodstream to be used as energy. By using energy sources the body has already stored, can reduce the cravings for food consumption. By increasing energy levels, Fennel seed may help to prolong physical activity when exercising or working out. It is a good source of vitamin C, and the seeds contain fiber and complex carbohydrates. Researchers have found that Fennel seed contains melatonin. In 2011, Researchers at the University of Granada performed a study to show that melatonin, a natural hormone, so it has been used to regulate healthy sleep patterns, which also helps control weight gain. Today, Fennel seed is being studied as having a role in the reduction of high blood pressure or hypertension. Calcium is an important mineral, as it helps to keep smooth muscles in the blood vessels toned and less likely to suffer injury. Calcium is also important for maintaining heart rate. 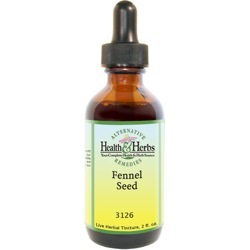 Fennel Seed contains numerous flavonoid antioxidants like kaempferol and quercetin. A powerful anti-inflammatory, Fennel tincture may help prevent oxidation and inflammation, thus preventing many chronic conditions. Its actions are thought to offer the body protection from cancers, infections, aging and degenerative neurological disease. Fennel is considered a very effective expectorant that has been known to expel mucus accumulations. It is a fine remedy for respiratory ailments, including asthma and bronchitis. The herb contains creosol and alpha-pinene, two agents that help to loosen phlegm and bronchial secretions and thereby ease non-productive coughs and relieve colds. Fennel appears to increase the efficacy of the antibiotic, streptomycin when used against tuberculosis, although it shows no effect on the disease-causing bacteria themselves. Fennel is an herbal remedy that has been used to increase the function of the digestive system. This action may result in better absorption of vitamins and minerals, two things usually lacking in women with endometriosis and during the menstrual cycle. As an antifungal, Fennel is said to inhibit yeast growth and is effective against Candida Albicans. Recent studies show that Fennel Seed extract has an anti-fungal, antibacterial and anti-yeast activity against pathogenic organisms. Fennel Seed helps to normalize the liver function that increases the fat and protein metabolism which helps to inhibit bad estrogen in the women's body before or during the menstrual cycle. High levels of bad estrogen not only elevate endometrial cramps but can also increase the risk of cancer and abnormal cell growth. Fennel seeds health benefits have also been attributed to breast growth. Fennel is a phytoestrogen which means that it stimulates estrogen production in the body. When estrogen is stimulated, breast tissue growth is encouraged. As an added bonus, while increasing breast size, which many women find beneficial. Besides helping in breast growth it also increases milk production for lactating women and has been used to enrich and increase the flow of milk. The breast milk, in turn, supports healthy digestion in babies. Fennel's anti-inflammatory properties are another age-old remedy for alleviating stiff, painful joints, arthritis and rheumatism. This herb can help relieve water retention thereby helping to eliminate toxic wastes from the body, making it a good herbal remedy for treating arthritis and cellulite. It is also thought to hasten the healing of muscle strain and hernia. Recent studies show that Fennel Seed extract has an anti-fungal, antibacterial and anti-yeast activity against pathogenic organisms. As an antifungal, Fennel is said to inhibit yeast growth and is effective against Candida albicans. Fennel seed has been known to actually strengthen the eyes and hair, relax the body, sharpen the memory and has a cooling effect when one becomes overheated. It can be a cleansing ingredient when used in a facial steam for dry, as well as oily skin, and may also help to prevent wrinkles and acne. The herb is known to keep the skin toned and delay the onset of lines, dark spots and wrinkles. It may actually strengthen hair and prevent hair loss. It has been used to treat dandruff, itchiness, and bumps on the scalp, hair breakage and thinning. It has a wonderful cooling effect on the entire body in warm weather. The can be achieved by taking the herb in a tea with a bit of organic cane sugar and black salt. Fennel seeds are concentrated source of minerals like copper, iron, calcium, potassium, selenium, zinc, magnesium and manganese. Copper is required by the body for production of red blood cells. Iron is required for red blood cell formation. Zinc is a co-factor in many enzymes that help to regulate growth and development, sperm generation and nucleic acid synthesis. Potassium is an important component of cell and body fluids that help to control heart rate and blood pressure. Manganese is used by the body as a co-factor for the powerful antioxidant enzymes, superoxide dismutase. Fennel is also a storehouse for many vitamins. Used as a gargle, liquid Fennel seed extract is helpful in soothing a sore throat and sore gums, and as a mouthwash for bad breath. It has been applied to the eyes in a tea for reducing eye irritation and eye fatigue. Fennel is used externally by herbalists to reduce inflammation of the eyes (in eyewash) and skin, especially in cases of infection. Fennel's flavonoid qualities have been studied and may even help to prevent cataracts or treat vision-impairing disease of the eyes known as glaucoma. Fennels seeds might help to prevent osteoporosis, according to animal studies, by inhibiting production and activity of bone-destroying cells. At the same time, the zinc may help promote growth and development of the body. Ingredients: Fennel Seed, Structured Water, 20% Alcohol. Non-Alcohol: Fennel Seed, Structured Water, and Vegetable Glycerin. All of our ingredients are Certified Organic, Kosher, and Responsibly Wildcrafted. No genetically modified organisms (GMO's) are involved. All other products that are distributed by us meet our high-quality standards. Contraindications: Since Fennel increases concentrations of estrogen in the bloodstream, it should be avoided by pregnant women and by women who have any kind of estrogen-sensitive disorder, such as breast or uterine cancer, fibrocystic breasts, fibroids or ovarian cysts. Fennel should not be taken in excessive (many times the recommended dosage) amounts, and diabetics should use it in moderation, because of its natural sugar content. It is not recommended for people with liver damage. Fennel does not allow the body to absorb the antibiotic, Cipro®, and both should not be taken at the same time as antibiotics. Anyone allergic to celery, carrots, dill or anise should avoid Fennel, and the herb may produce photosensitivity in sunlight.